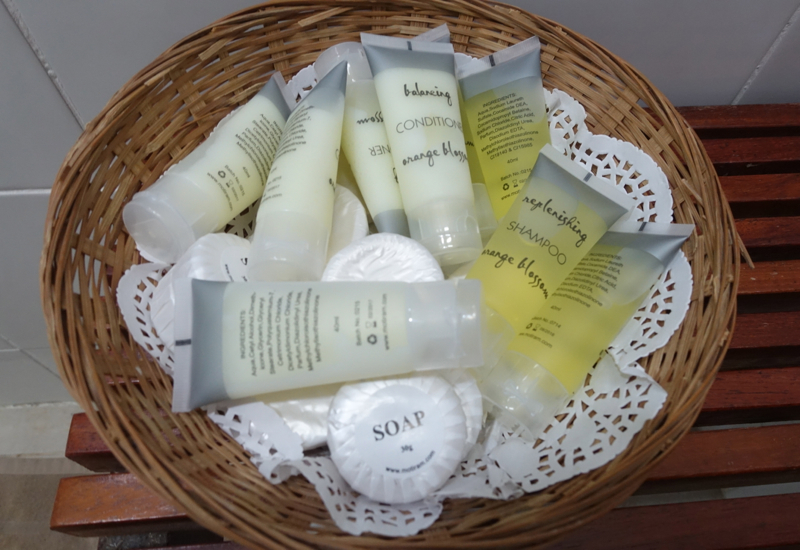 Children under 3 are granted complimentary entry with an adult, but children 3 and over are treated as adult guests. 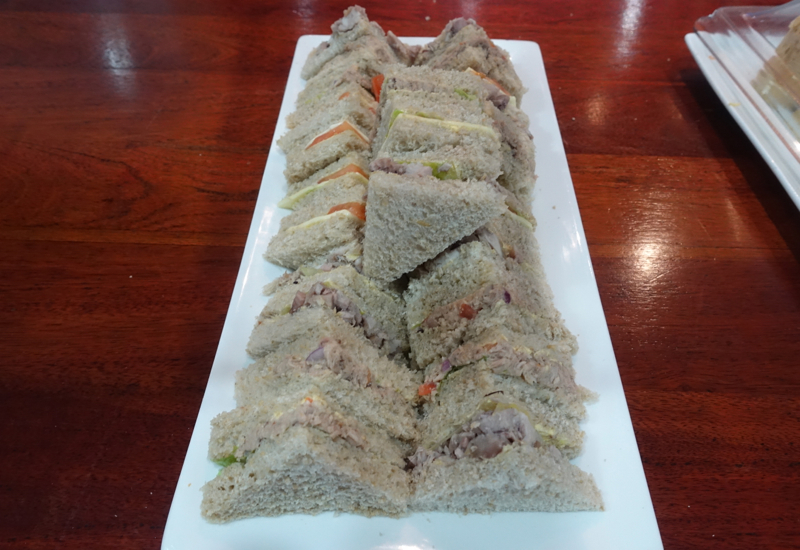 Qantas Club paid members are NOT granted complimentary access to the lounge, but may pay for access. 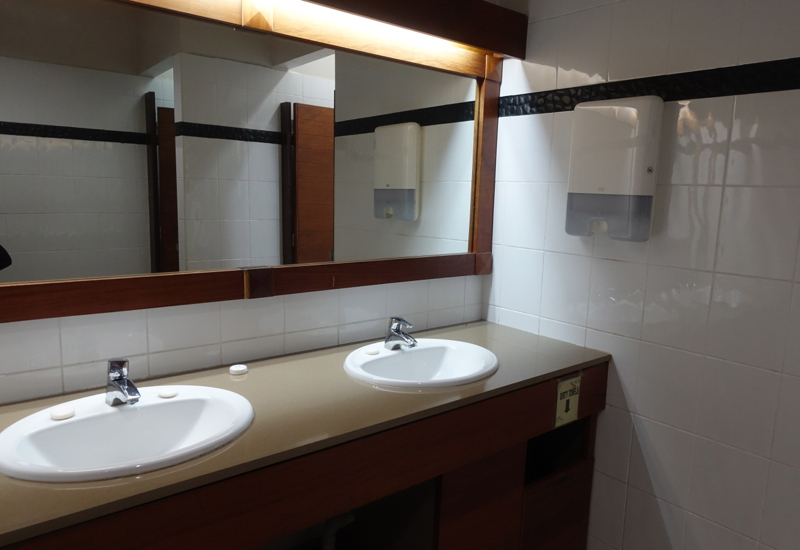 The Fiji Airways Tabua Club unfortunately is sorely lacking when it comes to one of the most crucial things for any traveler: power ports to charge phones, tablets and laptops. The few power outlets by every other set of window chairs were already taken by existing guests, so it was a good thing my laptop had been charged at the hotel so that I could get some work done. The WiFi was usable, although not as fast as at the Sofitel Fiji. 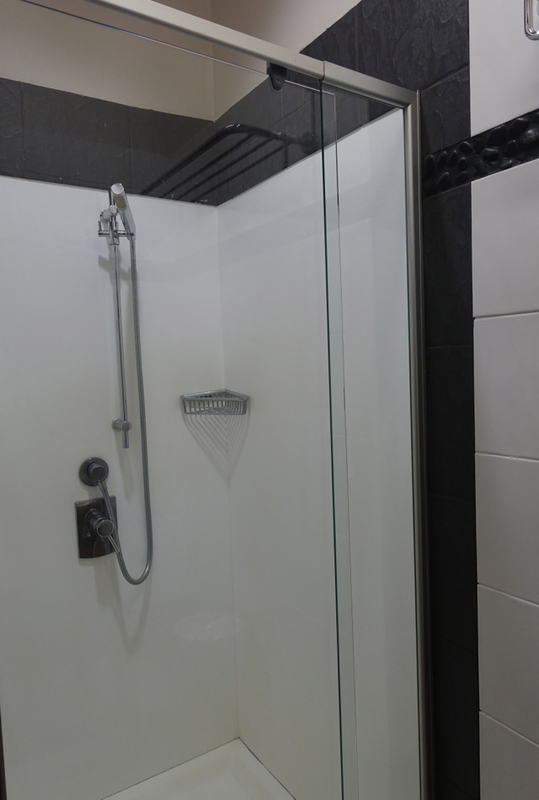 The bathroom is basic, but does have a shower, which is handy given the long flight for travelers returning to the U.S.
We sat in the four seats by the spirits and wines that were on offer, which included Jack Daniels Whisky, Bombay Sapphire Gin, Absolute Vodka, Johnny Walker Black Label Whisky, Courvoisier, and red wine. 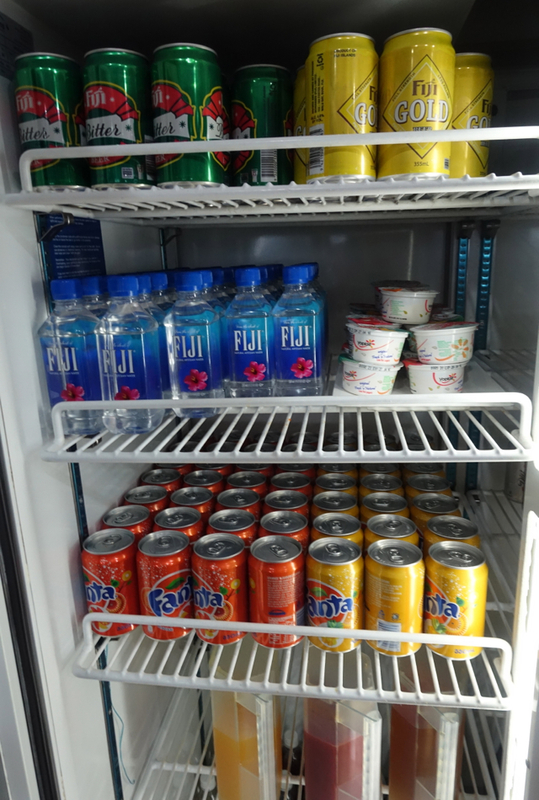 Chilled drinks included Fiji Water (of course! 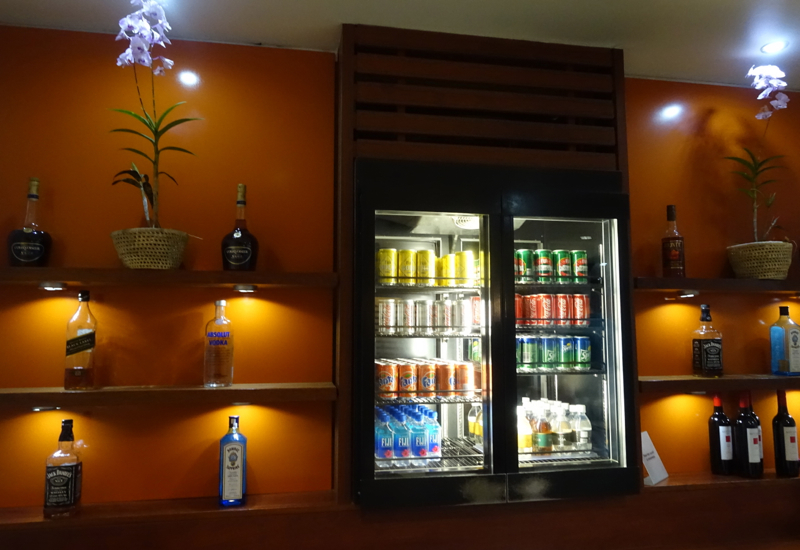 ), juices, Coca-Cola, Sprite, Fanta, and Fiji Gold Beer. 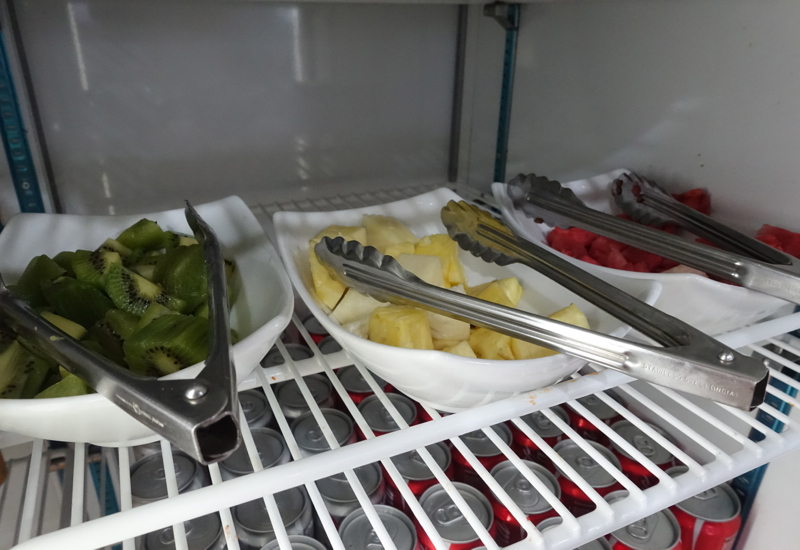 There was also some cut fresh fruit: pineapple, watermelon and kiwi. 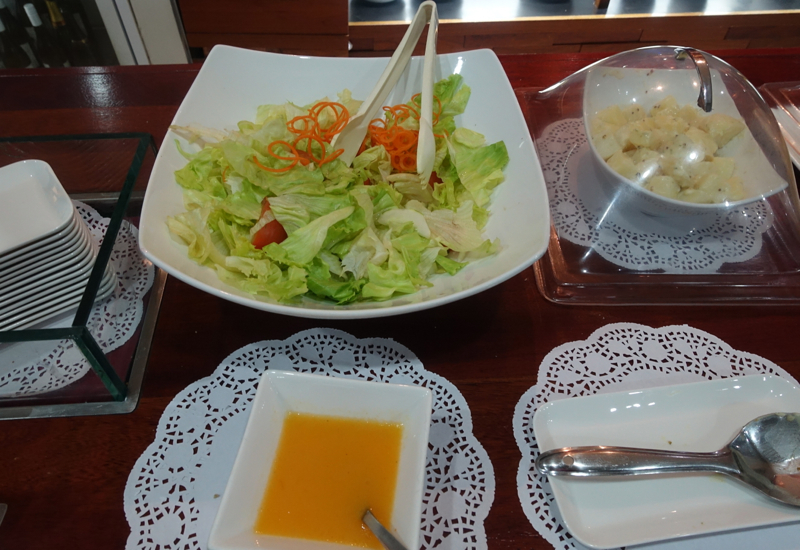 What we ended up eating the most of was Yoplait yogurt–the mango yogurt was especially tasty. 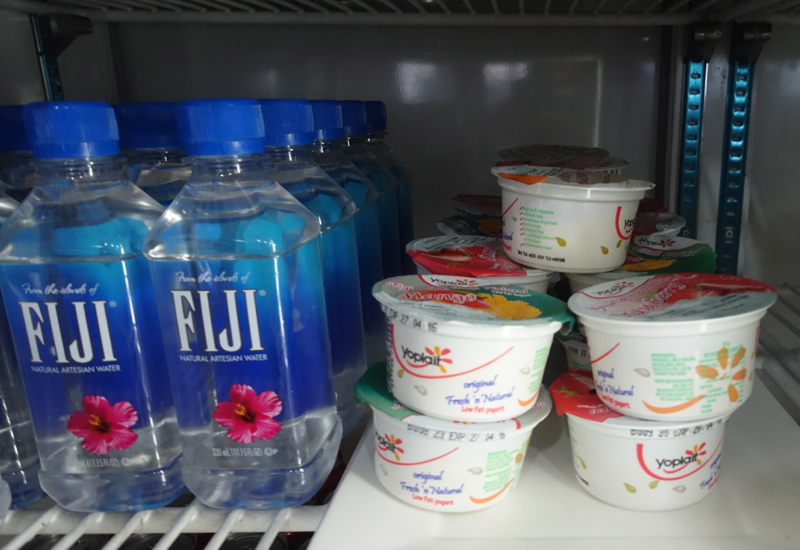 Generally Yoplait yogurt in the U.S. is plain awful, but yogurt is one of those things that varies from country to country, and this Fiji-made Yoplait was actually quite good. 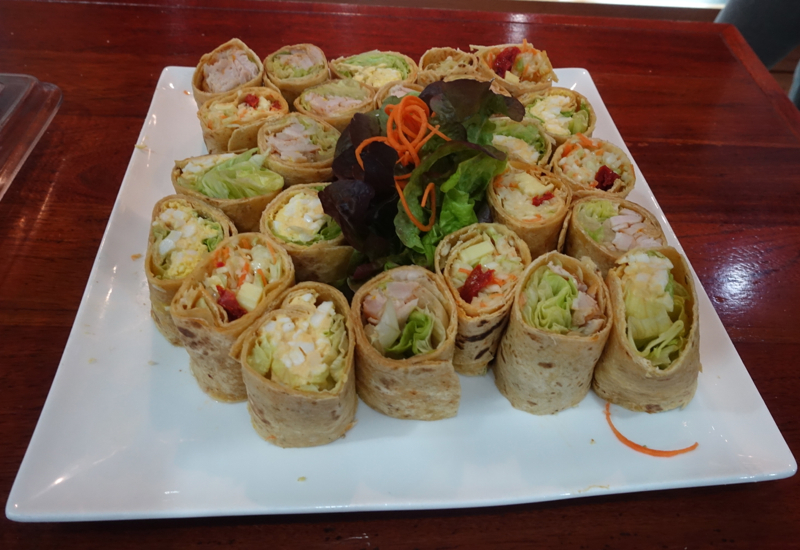 The buffet selection when we first arrived included sandwiches, wraps and salad. 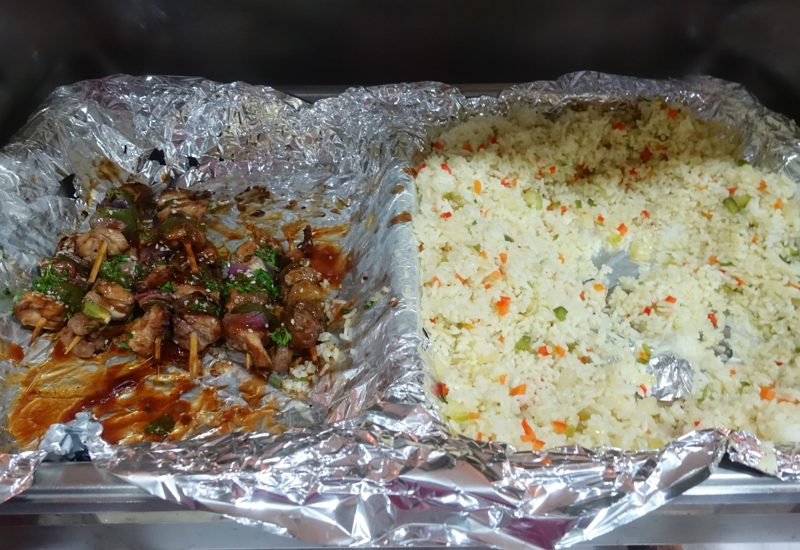 Later, about an hour before our flight, some hot rice and marinated pork skewers were also added to the buffet. 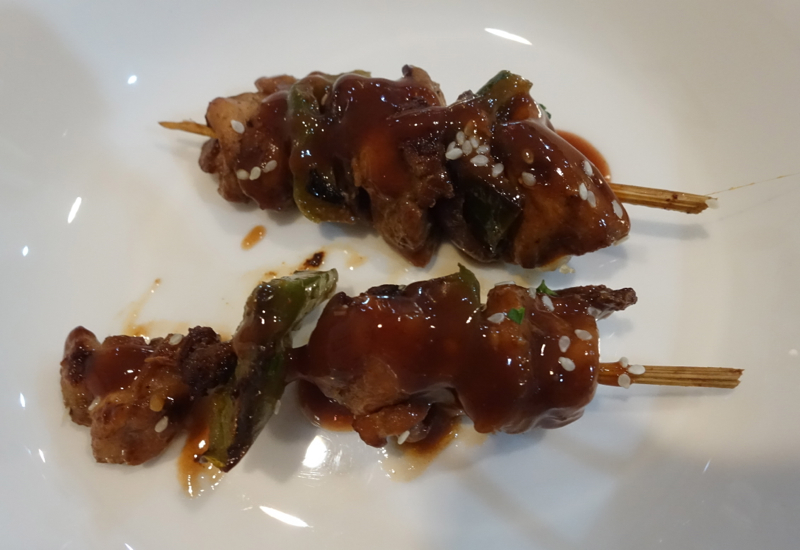 I tried the pork and it was very tasty for lounge food. 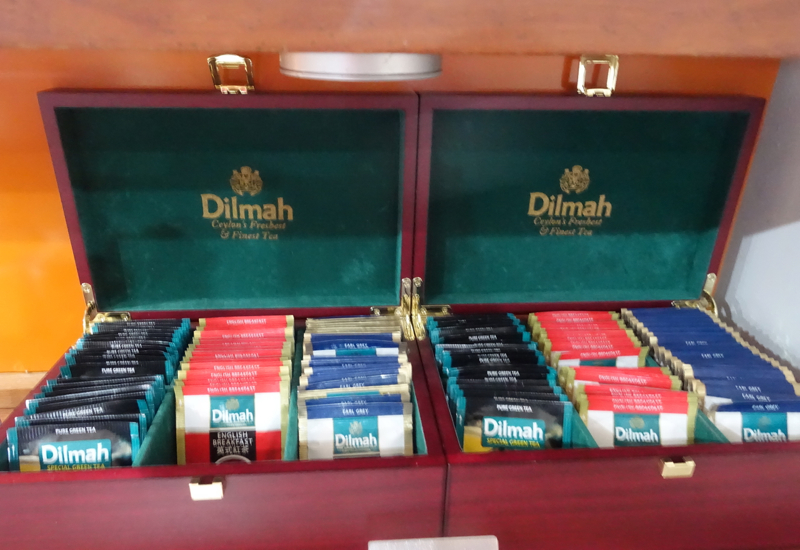 I didn't have any coffee or tea, but the provided tea is by Dilmah. 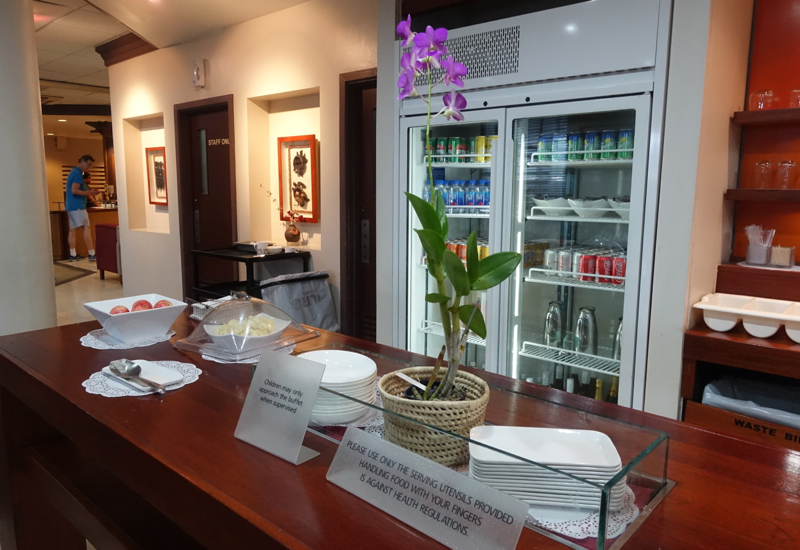 Under normal circumstances we would not have gone out of our way to arrive early to spend extra time in the Fiji Airways Tabua Club Lounge, although it was a good thing our hotel had organized a bus that got us to the airport 10 hours before our original flight time, since our flight ending up departing 7 hours early, to avoid the brunt of the storm coming in. 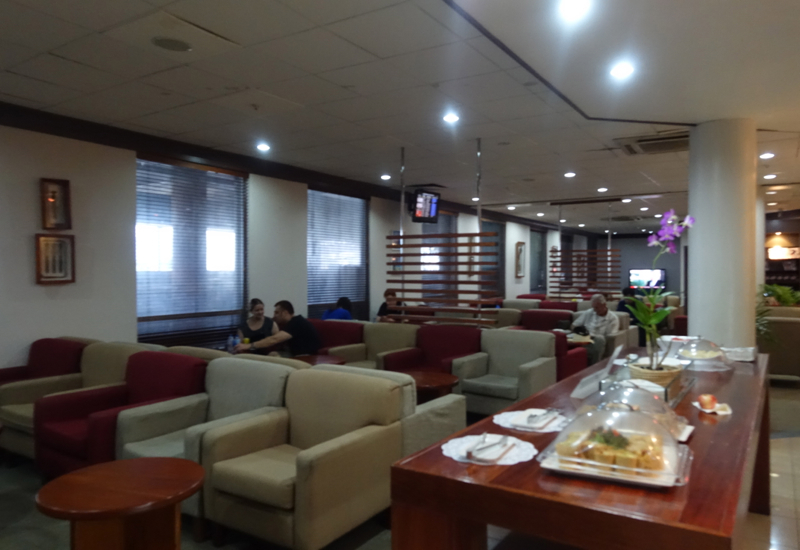 Given how small Nadi Airport is, the Tabua Club Lounge is what you'd expect in terms of lounge size, with the food and drink you'd expect plus a little bonus in terms of a hot food item, at least if you're there in the afternoon as we were. The WiFi is decent, but what the lounge really needs is more power outlets. The staff member at reception was very kind, offering to charge my computer at an outlet at reception, but the lack of public power outlets is an oversight for a business class lounge. 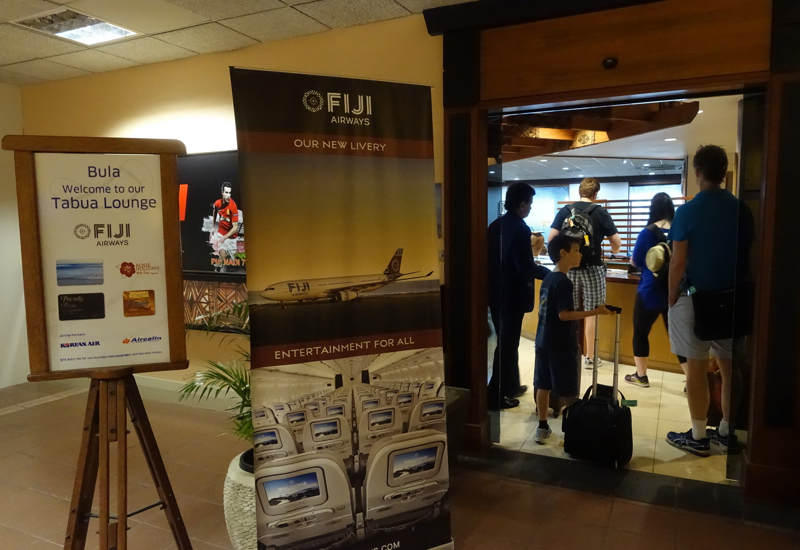 If you've visited the Fiji Airways Tabua Lounge in Nadi Airport, what was your experience? Become a TravelSort Client and Book Your Fiji resort with Virtuoso VIP Amenities!